Downtown Bethesda's featured (and only) Townhome Developments Please read more about The City Towns of Edgemoor and The Villages of Bethesda below. Downtown Bethesda townhomes are a rarity. The “original” townhomes (if you want to extend the boundaries beyond downtown Bethesda a little). The Villages ofBethesda is located in the heart of Downtown Bethesda. Just steps from the Metro, surrounded by wonderful restaurants, boutique shopping, numerous art galleries, the Montgomery County Library and other leisure activities that you would like at your front door. TheVillages of Bethesda affords a premier location for this outstanding development of 21 finely crafted townhomes in the colonial revival style, with picturesque facades to compliment the surroundings. The rise of the downtown Bethesda townhouses officially in the Edgemoor nrighborhood came in a few phases. Developer Larry Brandt started the ball rolling when the bought the property on the corner of Edgemoor and Arlington and began construction of the Villages of Bethesda, a community of 21 luxury townhomes, all with fireplaces and a common underground garage. Square footage ranges between 2000 square feet to a shade over 3000 square feet. Completed in 1999, these units took a little longer to construct and sell than the developer had hoped, but the finished product remains extremely popular. Some time after the Brandt acquisition, Lenny Greenberg bought a couple of single family homes on Montgomery Lane, just off o fArlington Road, across from the Bethesda Library. He began construction of City Homes of Edgemoor and sold out before there was a hole in the ground. Phase 1 held three rows of 4 level townhomes (approximately 2400 square feet of living space). Two of the rows had 6 townhomes each and the third row had only 5. In the third row, the developer (Lenny Greenberg) and the builder (Herman Porten) each claimed a unit that was 1-1/2 times the size of the others. These larger units have 3 car garages and elevators. Only two other units in Phase 1 have elevators. Phase 1 was completed in 1998. Two years later, Lenny Greenberg acquired a couple of other properties and hired Sandy Spring Builders to add two more rows of townhomes. Phase 2 consists of twelve units and is similar to Phase 1, but the units are a little larger (approximately 3000 square feet of living space) and all have elevators. Many who visit us at our open houses at the City Homes, ask about Kenwood Forest, and for good reason. 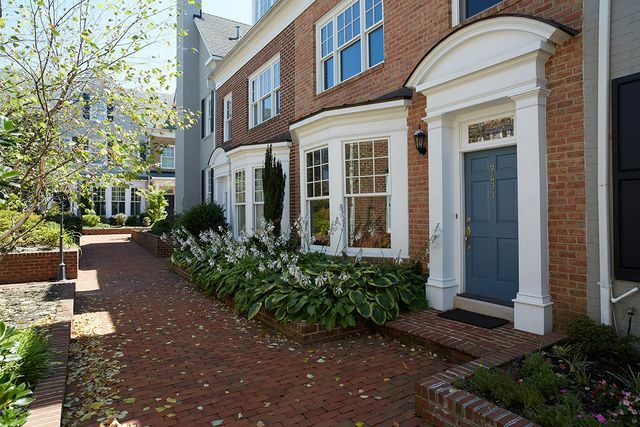 In the interest of education Kenwood Forest Townhomes are officially Chevy Chase condos. To be articulated on the blog! It appears there will only only be 50 Downtown "Bethesda Row" Townhouses. There is still a demand for multi level intown Bethesda "Brownsgtone" living, 1998 marked the last year where the value of land "demanded" higher density living. What began with 10 story High-rise Edgemoor, has leaned into the 18 Story Cheval. As Downtown Bethesda land values skyrocketed, it became much more profitable (perhaps the only way to be profitable) to go up and to build high end condos instead of high end townhomes. Contact us if we can help you buy or sell a Bethesda townhome. As previous Downtown Bethesda townhome owners and still downtown Bethesda residents, we know when a new unit becomes available before most! Bethesda Townhomes: 21 of the 60 Downtown Bethesda townhomes. Prices in this coveted Brownstone community range between the high 1.3 Millions for a 2000 square foot model, to north of 1.6 Million for one of the several 3000 square foot model. Want to Learned more about the Villages of Downtown Bethesda?